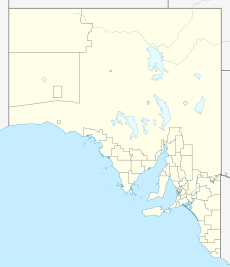 Coobowie is a town in the Australian state of South Australia near the south-eastern tip of Yorke Peninsula. Coobowie was proclaimed in 1875. Coobowie comes from an Aboriginal word meaning "wild fowl water". At the 2011 census, Coobowie shared a population of 220 with other localities. Coobowie's current outlook is to create many new features, including a new visitor information pull in being built. [according to whom?] The cafe also has a florist. The protected area known as the Coobowie Aquatic Reserve is partly located within Coobowie with the remainder being located in the adjoining bay, Salt Creek Bay. ^ Australian Bureau of Statistics (31 October 2012). "Coobowie". 2011 Census QuickStats. Retrieved 8 April 2016. ^ a b c d "Search result for "Coobowie (Locality bounded)" (Record no. SA0015219) with the following layers selected - "Suburbs and Localities" and " Place names (gazetteer)"". Property Location Browser. Government of South Australia. Archived from the original on 12 October 2016. Retrieved 24 June 2016. ^ a b "Coobowie, South Australia (Postcode)". postcodes-australia.com. Retrieved 24 June 2016. ^ a b c "Monthly climate statistics: Summary statistics Edithburgh (nearest station)". Commonwealth of Australia , Bureau of Meteorology. Retrieved 24 June 2016.